Mount Polley mine is operated by Imperial Metals and is an open-pit copper and gold mine with a four kilometre-wide tailings pond built with an earthen dam. It’s located in central BC, west of Williams Lake and near the community of Likely. In the wee hours of August 4, the four kilometre long dam containing the tailings pond of the copper and gold mine, burst sending millions of tons of contaminated water, mud, and mining muck into the salmon-bearing water system, including Quesnel Lake, Polly Lake, Hazeltine Creek, and Cariboo Creek, according to the Cariboo Regional District. There’s a water ban, including recreational activities, and the small community town of Likely, BC, sitting near the mine, is particularly affected. Hazeltine Creek, previously a stream two metres wide, is now a wasteland 50 metres across, after five million cubic metres of effluent flooded into nearby Polley Lake and carved its own path several kilometres in length to Quesnel Lake. First, a Science Lesson – What Exactly Are Tailings and What Is a Tailings Pond? Tailings are by-products left over from mining and extracting resources, such as extracting bitumen from the oilsands or minerals such as copper or gold from ores. Tailings include finely ground rock particles, chemicals used to extract the valuable minerals, and water. The rock particles and other chemicals can undergo chemical reactions during storage and this generates additional by-products, such as acid and other dissolved metals that can more easily leach into waterways. These reactions happen rather quickly in tailings because, compared to bigger particles, small particles have a very high surface area where reactions can take place. Many substances found in tailings can be toxic. A tailings pond is a wet storage area for tailings that allows them to be continuously submerged. These are engineered structures created through the use of dams, berms, and natural features such as valleys, hillsides or depressions. So now the question is, could this disaster have been prevented? A former employee of the mine, Gerald MacBurney who worked there for seven years, ending up as the tailings foreman, left the company in June and is speaking up about why. He says that he fought management at the Polly Mine for two years to get the rock they needed to build up the dam properly. He claims they needed to put in five million tonnes of rock around the dam to support the mine’s growth – the dam was never designed to hold five times that amount of water unless it was built up properly. Only a couple hundred thousand tonnes were added, he said, and that was the point where he’d had enough. 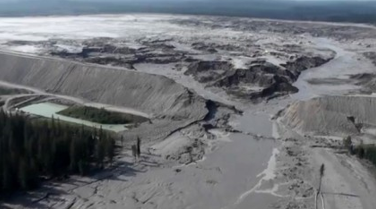 Is Governmental Mismanagement to Blame for the Tailings Pond Disaster? BC NDP leader John Horgan said the tailings pond failure might be the worst industrial accident in BC and the government needs to be held accountable. He says that the Liberals need to release all the records and reports on the development, monitoring, and enforcement of the tailings pond. Mount Polley is just one of six mines owned, or partially owned and operated, by Imperial Metals. There’s little information whether the other mines’ tailings ponds could be dangerous, although the Huckleberry mine – 50% owned by Imperial Metals – recently had a physical failure at SAG mill, back in February 2014. Whatever the case, the damage to the environment is extensive, and disruption to tourism will last a long time. And not to mention the upheaval of residents’ daily lives. At some point, somebody needs to take the blame for this, whether it’s mine management or the government. If past or current employees come forward with information that could shed light on possible tragedy in any organization, why aren’t they taken seriously? Upper management needs to start looking to it’s employees for information that could help the organization keep its head up. Organizations that employ third party ethics reporting systems are taking that step in the fight against wrongdoing. They want to hear from font-end employees about the inner workings of the organization so that together, they can ensure the organization grows and prospers. To them we say kudos! Don’t Wait Until the Dam Bursts! Seriously! Don’t have a third party ethics reporting system? Not sure how to implement one? Not to worry – we’ve got you covered. A third party ethics reporting system is the first place your employees can go to report on any type of behaviour that seems questionable. A powerful tool that enables the reporting of any type of wrongdoing in a confidential and anonymous fashion ensures your employees can feel secure that whatever they feel they need to report on, they can do so safely. And management can investigate any potential organizational-altering issues. Whistleblower Security offers a third party ethics reporting system operating a 24/7/365 hotline, where employees can be assured that all of their ethical concerns will be heard and addressed. Curious about how to implement an ethics reporting culture? It’s quite easy actually.